Many farmers have expanded to weave baskets, make pots, and breed silk worms to produce silk for weaving. In recent years, more sculptors and painters have surfaced to produce marvelous pieces for tourists to take home. Silk weaving in Cambodia has a long history. The practice dates to as early as the first century when textiles were used in trade. Modern textile production skillfully mimics these historic antecedents and produce beautiful motifs that echo clothing details on ancient stone sculptures. 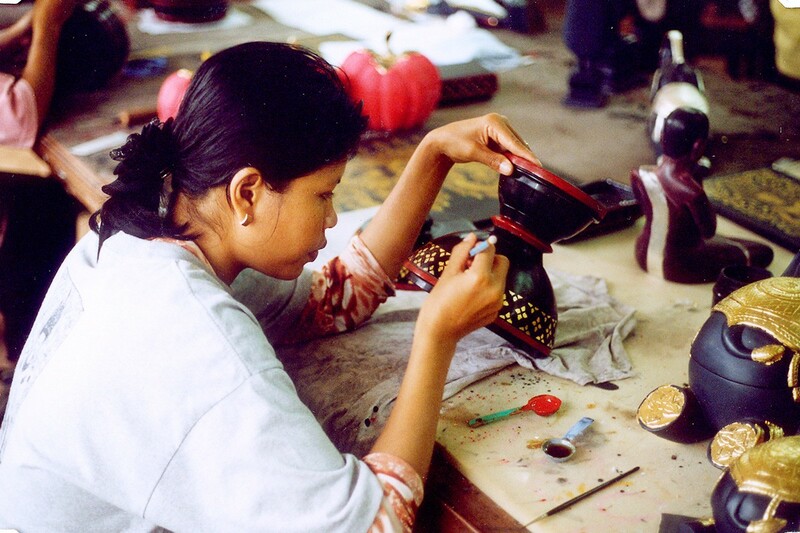 By tourists’ demand, skill workers are producing silverwork in the forms of jewelry, souvenir items, especially boxes adorned with fruit and Angkor-inspired motifs. Usually the men produce most of the forms for such work and the women complete the intricate filigree. Silver work Carving Efforts to restore Angkor resulted in a new demand for skilled stone carvers to replace missing or damaged pieces and from that, a new tradition of stone carving has risen in recent years. While some modern carvings remain traditional-style, some carvers have been successfully producing contemporary designs to satisfy market demands.